If something is small and you can give us so much power in our health every day, these are the seeds … Chia seeds, flax seeds, pumpkin seeds, sesame seeds and sunflower seeds among others, all come full health for us. To start one of the most powerful source of healthy fatty acids exist, acids that our bodies can not generate themselves such as omega 3 and omega 6. But they are also good sources of vitamins, fight free radicals that are linked to certain types of cancer, aging and deterioration of our body and also to other diseases, and as if that were not enough (which it is not) also contribute to reduce high blood pressure and cholesterol. Want to know the best part? You can eat them without realizing adding a tablespoon to your soups, sauces, salads, pies, meats and obtaining all fantastic benefits. These seeds have a high concentration of zinc which is believed to be an important resource in the treatment and prevention of prostate problems. Also improve kidney problems and remove parasites from the intestines. You can eat them alone as sunflower seeds, or in a soup or stew. There is nothing better than sitting down with a handful of seeds baked and salted sunflower, as we did in our childhood. These seeds promotes good heart health. We’re talking about an incredible source of vitamin E which is an antioxidant that fights free radicals. Vitamin E also contains anti-inflammatory properties that help e.g. asthma, arthritis and menopause. They also contain phytosterols, which are substances found in plants that reduce bad cholesterol and improve the immune system. Have the property of absorbing water and thereby act as hydration method, making it a major food for athletes. The fact that absorb water also cause a positive impact on the digestive processes among which we can mention that the speed is reduced when the body converts carbohydrates into simple sugar and the rate at which calories are absorbed. Put another way can contribute to weight loss to make us feel satisfied with the food we eat longer. They can also be beneficial for people with diabetes because of the slowness with which carbohydrates are converted into sugar. Sesame seeds in turn help to reduce blood pressure, have a good amount of vitamin E and also contain compounds that help to have a good liver health. It is also believed that their oils are beneficial for the skin and preventing wrinkles. Eat them in a mashed avocado in homemade breads, pastas, salads, cereal, fruit. His key point is having digestive benefits and contributes to colon health as well being a fantastic resource to help with constipation. You can start eating scattering them over the pot of cereal with fruit or yogurt every day. 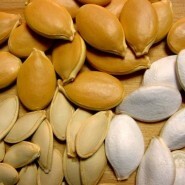 Come seeds are easy to add to our daily diet. You can have variety at home and add a different meal each day. In addition to the recommendations of meals you mentioned can also be consumed in juice, a glass of milk, smoothies and shakes up a pizza pie. Come seeds, your health will be very grateful.